This node has the potential to become Starred Content. Content that is of great quality or usefulness is usually promoted to the front page as Starred Content, but only if it meets Quadropolis posting standards. Please fix the other issues with this node so that a moderator can promote it. 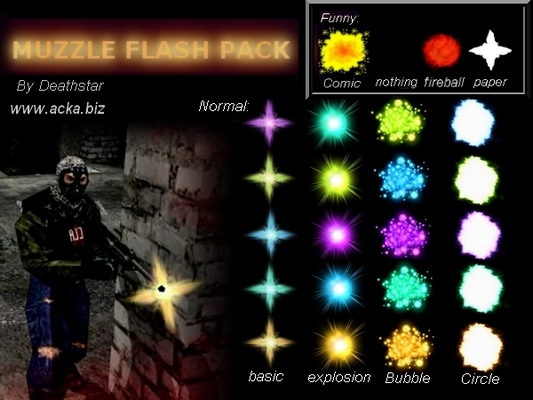 - Others: Some funny muzzleflashs ! * Paper = Paper muzzleflash. * Nothing = No muzzleflash. This deserves in the Starred Section. Nice! It's certainly entertaining .. I almost tagged it "starred content" too .. but then I saw all them Thumbs.db files in the ZIP .. and that the node-image is in there too. That ZIP will need to be cleared up for "starred content"! An installation HowTo would be nice too! I'll definitely have some fun testing out some of the weirder options he's given us, for sure!! cool is there a way to use it in sauerbraten? You need a bit of tecnic for this ! in misc folder of the principal ac.